Olfaction, the sense of smell, is the detection of chemicals dissolved in air. It is one of the five senses originally described by Aristotle. There are two primary senses that detect chemicals: smell and taste. The chemicals that evoke a sensation of smell are called aromas, fragrances, odors, or odorants. The sense of smell is also important in the perception of flavor. People do not have the most sensitive sense of smell in the animal kingdom. The bloodhound, for example, has 76 times the surface area of nasal epithelium as humans and four billion olfactory receptor cells relative to a human's 30 million (Chudler 2007). But people do seem to have the greatest emotional response to smell. A given smell can evoke very strong emotions that cause one to pick up a particular flower and continue smelling and reminiscing over a long period of time. This type of behavior is unknown among other animals. Most of this article is devoted to olfaction in humans, with an overview of olfaction among animals in general. Retronasal route. This is the pathway that is most used in olfactory perception. The odorant enters into the mouth and then diffuses through the nasopharynx to the nasal receptors and then out the nostrils. The nasal receptors are located on cilia in the nasal mucosa (see diagram). The odorant molecules interact with the odor receptors on these cilia in a way that continues to defy scientists. This process of give-and-take interaction, whether it is a lock-and-key type or vibrational tunneling or some other process is still debated hotly. Once the odorant has been bound to a matching receptor(s), a neural signal is produced that travels along the receptor axon through the cribiform layer of the ethmoidal bone to the glomerular enlargement of the mitral cells, which lie in the olfactory bulb. These cells produce a signal which is modified by several other cell types until it is sent down the olfactory nerve tract to several brain areas, where it can be consciously perceived, cataloged, put into memory, and linked with other perceived sensations. Covering the roof of the nasal cavity of human beings lie two separate regions of nasal epithelium, each measuring only 2.5 cm2, but containing a total of 10-50 million receptor cells based on estimates of various authors. This layer extends along the superior concha forming a pseudostratified columnar ciliated epithelium composed of three types of cells: (1) olfactory receptor cells,(2) basal cells, and (3) supporting cells. Before odorous compounds can reach the nasal epithelium, they must pass through a 60 micron layer of mucous that is secreted by Bowman's glands. Within this mucous layer lie the nonmotile cilia of the olfactory receptor neurons. Each cell contains 8-20 cilia with lengths from 30 to 200 microns (Leffingwell 2002). It is upon these olfactory receptor cilia, lying within the mucous layer, that odorants are detected and a neural signal is initiated. The basal cells are transformed over a period of about 40 days to become olfactory receptor cells (Leffingwell 2002). This is a rare instance of healthy neurons dying and being replaced by the transformation of non-nervous cells at regular intervals. The olfactory signals are carried from the olfactory bulb primarily by cranial nerve I, but the trigeminal nerve or cranial nerve V, is also involved in olfactory perception. Compounds creating a cooling sensation, such as menthol and camphor, as well as compounds creating a hot sensation, such as capsaicin, will produce a response in the trigeminal nerve. Human beings can detect thousands of different odors. The exact number of odorant molecules that can be detected is not known but one often hears estimates of 10,000. The number of synthetic molecules producing odors would appear to be almost unlimited. Each odorant molecule must be small enough to be volatile. No one has described an odor-producing molecule with a molecular weight greater than 294. This appears to be the size limit for a molecule to have sufficient volatility to be detected by the nasal receptors. Each olfactory receptor neuron (cell) in the nose interacts with only one specific characteristic of an odorant. Odor receptor nerve cells may function like a multiple lock and key system so that when any part of a specific molecule (a key) can fit into the receptor (lock), the nerve cell will be triggered and a specific odor will be perceived. Any given aroma probably interacts with several different types of receptors. The combination of receptor types that are triggered produces an odor perception specific to that molecule. According to shape theory, each receptor detects a feature of the odor molecule. Weak-shape theory, known as odotope theory, suggests that different receptors detect only small pieces of molecules, and these minimal inputs are combined to create a larger olfactory perception (similar to the way visual perception is built up of smaller, information-poor sensations, combined and refined to create a detailed overall perception). An alternative theory, the vibration theory proposed by Luca Turin (1996, 2002), proposes that odor receptors detect the frequencies of vibrations of odor molecules in the infrared range by inelastic electron tunneling (Turin 2004). Mammals have about 1,000 genes linked to odor reception. But only a small portion of these genes make functional polypeptides involved in odor detection. Humans have 347 functional odor receptor genes; the other genes (pseudogenes) are nonsense mutations. Each gene makes one specific type of receptor (Buck et al. 1991). This number will vary among ethnic groups and among individuals. For example, not all people can smell androstenone, a component of male and female sweat. If each human odor receptor gene makes a different receptor, and if each olfactory receptor neuron responds like a lock and key to a single odorant molecule, then we would have the ability to detect only 347 different odors. However, thousands of different aromas are differentiated by only a few hundred receptors. It seems that a single odorant must trigger several different receptors and that each receptor must be able to respond to more than one type of odorant. the receptor neuron becomes depolarized and produces an action potential. (1) The receptor consists of a large transmembrane protein that is part of the cell membrane of the cilia. It is thought to cross the membrane seven times before it connects to a G -protein. (2) The so called G - protein gets its name from its ability to bind guanosine triphosphate (GTP) and guanosine diphosphate (GDP). In the resting or inactive state the G-protein binds GDP. When an odorant activates the receptor protein, the G-protein binds GTP and enters an active state. (3,4) When adenyl cyclase is activated it converts adenosine triphosphate (ATP) to cyclic adenosine monophosphate or cyclic AMP (cAMP). Cyclic AMP acts like an intracellular hormone and is often called a "second messenger"—the "first messenger," in this case, being the odorant. In some animals, there is evidence of cAMP being released as a second messenger for some odorants (i.e., eugenol), and inositol triphosphate being an alternative second messenger for other odorants (i.e., ethyl vanillin) (Leffingwell 2002). (5,6) Production of cAMP opens an ion channel for calcium ions which produces an influx of calcium ions (Ca++) into the cell causing it to become depolarized. These Ca++ in turn open a calcium-activated chloride channel leading to an efflux of chloride ions (Cl-) and this further depolarizes the cell and triggers an action potential. (7) This action potential travels across this bipolar cell to synapse onto the glomerular dendrite of the mitral cells of the olfactory bulb. 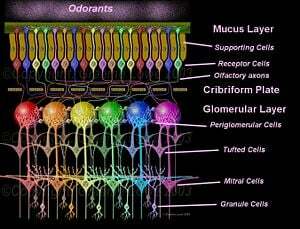 Olfactory sensory neurons with identical receptors are spread throughout the sensory epithelium. These bipolar cells send their axons through the ethmoidal bone into the olfactory bulb in bundles of roughly 10-100 axons each. Thus each type of receptor, dispersed throughout the sensory area, is reunited with its own kind in bundles to send its signal into the olfactory bulb. This convergence of signals from multiple cells, of the same type, onto a single glomerular cell serves to amplify the response to an aroma. In the case of rabbits, some 26,000 receptor cells converge onto only 200 glomeruli, which then converge onto 25 mitral cells. This results in an amplification of about 1,000:1 (Leffingwell 2002, Jacob 2007). This organization of the olfactory bulb is reminiscent of the retinal layers. The major neuronal cells of the olfactory bulb are the mitral cells. Adult human beings have about 50,000 mitral cells in each olfactory bulb (Jacob 2007). The mitral cells send out apical dendrites, which form a spherical bulb called a glomerulus. Signals are processed at an intraglomerular level for one specific type of receptor. Signals are also processed at an interglomerular level by periglomerular cells, whose action seems to be primarily inhibitory through the release of gamma amino butyric acid (GABA)(Jacob 2007). Both mitral cells and tufted cells provide output to higher olfactory cortical centers (Lowe 2004). The tufted cells, lying below the glomerular level, often make connections to several adjacent glomeruli. The granule cell bodies lie in a layer below the mitral cell bodies and they make connections with several different types of mitral cells. The dendrites of the granule cells are covered with GABA-containing spines. The processing of odorant signals from different types of odors is very complex with a lot of intercellular and intracellular summing and subtraction of multiple signal inputs. The final signal perceived as an odor is the result of multiple amplification and or inhibition involving many types of neuronal cells. Olfactory bipolar sensory neurons send axons to the mitral cell dendrites (glomeruli) and the tufted cells. The final output of the olfactory bulb cells forms the lateral olfactory tract, which travels to higher cortical centers of the brain within the olfactory nerve or cranial nerve I. The main destination of the olfactory nerve tract is the primary olfactory cortex (pyriform cortex) in the medial temporal lobe of the brain. The olfactory nerve tracts disobey a general rule followed by sensory systems; i.e., they do not pass through the brainstem or thalamus before reaching the cortex (Weedman 1997). Olfactory tracts also travel to the prepyriform cortex, the amygdala, the septal nuclei, the entorhinal cortex, hippocampus, and subiculum. Many of these areas are part of the limbic system, which is involved in the formation of emotions and memories. The septal nuclei and amygdala are part of the "pleasure center." The hippocampus is associated with memory and food sensations. Olfactory signals are also sent to the thalamus and the frontal cortex for recognition (Jacob 2007). In the brain, multiple features of the odor may be combined to form a synthesized olfactory perception. Since olfactory receptors can detect many chemical features of an odor molecule, the combination of features gives the olfactory system a broad range of odors that it can detect. Scientists have devised methods for quantifying the intensity of odors, particularly for the purpose of analyzing unpleasant or objectionable odors released by an industrial source into a community. Since the 1800s, industrial countries have encountered incidents where an industrial source or landfill produced an airborne odor that created adverse reactions in nearby residents. The basic process to quantify an odor is to measure the amount of dilution with "pure" air that is required before the "bad" air is rendered indistinguishable from the "pure" or reference air. Since each person perceives odor differently, an "odor panel" composed of several different people is assembled, each sniffing the same sample of diluted "bad" air. An alternative procedure, known as purge and trap, involves pumping known volumes of off-smelling air into a trap containing an absorbant and then desorbing the trap onto a gas chromatographic column. This allows one to analyze the composition of the odor as well as determine its concentration. A third procedure called solid phase microextraction (S.P.M.E.) involves inserting a needle coated with a selective adsorbant into a sample of air for a fixed period of time and then inserting the needle into the hot inlet of a gas chromatograph/mass spectrometer, where it desorbs onto the column and provides qualitative and quantitative information about all the odorants collected. Scientists have also developed several types of machines that attempt to mimic the human nose. They are usually referred to as electronic noses or E-noses. They consist of several arrays of sensors that are sensitive to certain types of molecules. The intensity of an odor does not appear to be determined in the same way as odorant character. It may be the result of the strength of the binding of the odorant to the receptor (Turin et al. 2003). Many air management districts in the United States have numerical standards of acceptability for the intensity of odor that is allowed to cross into a residential property. The Bay Area Air Quality Management District has applied its standard in regulating numerous industries, landfills, and sewage treatment plants in the following areas: (1) San Mateo, California wastewater treatment plant; (2) the Bill Graham ampitheatre, (3) Mountain View, California; and (4) the IT Corporation waste ponds in Martinez, California (CEST 2005). Olfaction, taste, and trigeminal nerve receptors together contribute to flavor. The human tongue can only distinguish among five distinct types of taste: (1) sweet,(2) salty, (3) sour, (4) bitter, and (5) umami. Meanwhile, the nose can distinguish among thousands of substances, even in minute quantities. The importance and sensitivity of smell varies among different organisms. The relative sensitivity between different classes of vertebrates varies with the specific compound being tested. Many mammals have a good sense of smell, and it is especially well developed in the carnivores (e.g., cats, dogs) and ungulates (e.g., cattle, deer, pigs). Cats have 21 cm2 surface area of nasal epithelium, or about four times more than human beings. Some dogs have 170 cm2 of nasal epithelial surface area, but the highest surface area is found in the bloodhound with 381 cm2 (Chudler 2007), or 76 times the surface area found in humans. When we compare the sense of smell based on the number of olfactory receptor cells (ORC) we find that human beings have about 30 million receptors, rabbits have 100 million ORC, and most dogs have one billion ORC; the bloodhound has four billion ORC (Chudler 2007). When German shepherds were tested against people in smelling alpha ionone, a compound found in raspberries, the dogs were 10,000 times more sensitive than human beings (Marshall et al. 1981). The bloodhound is thought to have the keenest sense of smell of any dog. It was bred for the specific purpose of tracking human beings, and can detect a scent trail a few days old. The presumed second most sensitive nose is possessed by the basset hound, which was bred to track and hunt rabbits and other small animals. There are stories of bears having a more sensitive sense of smell than even the bloodhound. People have used pigs to locate truffles buried as much as one meter underground. There are many animals that have not been tested under controlled conditions and their lower limit of detection may surpass the ability of the bloodhound. The sense of smell has not been well studied in birds. Pigeons are thought to return home based on odors, but this theory has not been substantiated. Birds at sea were able to smell krill-flavored vegetable oil slicks on the water. Petrels seemed to be quicker to respond than albatrosses (Nevitt 1999). A study of the literature and the comparative anatomy of the olfactory chambers of several birds suggests that the following birds have olfactory ability: (1) the kiwi of New Zealand, (2) albatrosses, shearwaters, and petrels, (3) the turkey vulture, (4) the oilbird (Steatornis caripensis), and (5) honey guides of the family Indicatoridae (Stager 1967). Most vertebrates have a vomeronasal organ. Reptiles and amphibians have it located in the vomer, inside the mouth on the upper palate. Snakes and lizards use it to smell prey by sticking their forked tongue out to sample the air and putting it back into their mouth, and they insert their tongue into two pits in the roof of their mouth. This organ is also referred to as Jacobson's organ. Some mammals, such as horses, make a face, called flehmen, to direct air to this organ. A male silkworm moth, can sense a single molecule of bombykol, a pheromone released by the female moth. In insects, smells are sensed by sensilla located on the antennae and first processed by the antennal lobe (analogous to the olfactory bulb), and next by the mushroom bodies. Insects use their antennae primarily for olfaction. Sensory neurons in the antenna generate odor-specific electrical signals in response to odor. They process these signals from the sensory neurons in the antennal lobe, followed by the mushroom body and lateral horn of the brain. The antennae have the sensory neurons in the sensilla and they have their axons terminating in the antennal lobes, where they synapse with other neurons there in glomeruli. These antennal lobes have two kinds of neurons, projection neurons (excitatory) and local neurons (inhibitory). 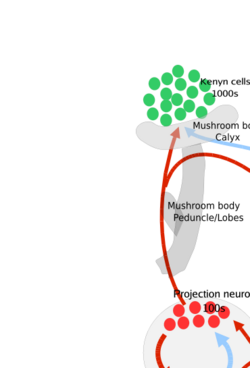 The projection neurons send their axon terminals to the mushroom body and the lateral horn (both of which are part of the protocerebrum). Local neurons have no axons. Recordings from projection neurons show, in some insects, strong specialization and discrimination for the odors presented (especially for the projection neurons of the macroglomeruli—a specialized complex of glomeruli responsible for pheromone detection). Processing beyond this level is not exactly known (CEST 2005). Berg, B. 2004. The scent of surprise Fred Hutchinson Cancer Research Center. Retrieved March 17, 2007. Buck, L., and R. Axel. 1991. "A novel multigene family may encode odorant receptors: A molecular basis for odor recognition." Cell 65: 175-183. Chudler, Eric. 2007. Brain facts and figures. Eric H. Chudler, University of Washington, website. Retrieved March 18, 2007. CEST. 2005. Olfaction. In McGraw-Hill Concise Encyclopedia of Science and Technology, 5th edition. New York: McGraw-Hill Companies. ISBN 0071429573. Hirsch, A. R. 2003. Life's a Smelling Success. Mt. Shasta, CA: Authors of Unity Publishing. ISBN 0972525017. Jacob, T. 2007. Olfaction. Cardiff University, UK. Retrieved March 18, 2007. Keller, A., and L. B. Vosshall. 2004. "A psychophysical test of the vibration theory of olfaction." Nature Neuroscience 7: 337-338. Leffingwell, J. C. 2002. Olfaction, Update No. 5. Leffingwell & Associates. Retrieved March 18, 2007. Lowe, G. 2004. The olfactory bulb. Monell Chemical Senses Center. Retrieved February 15, 2007. Marshall, D. A., and D. G. Moulton. 1981. "Olfactory sensitivity of alpha ionone in humans and dogs." Chemical Senses 6: 53-61. Nagele, R. G. 2002. Lectures on the olfactory epithelium. University of Medicine and Dentistry of New Jersey. Retrieved March 18, 2007. Nevitt, G. 1999. "Olfactory foraging in Antarctic seabirds:a species-specific attraction to krill odors." Marine Ecology Progress Series 177: 235-241. Stager, K. E. 1967. "Avian Olfaction." American Zoologist 7(3): 415-420. Stopfer, M., V. Jayaraman, and G. Laurent. 2003. "Intensity versus identity coding in an olfactory system." Neuron 39: 991-1004. Stopfer, M., and G. Laurent. 1999. "Short-term memory in olfactory network dynamics." Nature 402: 664-668. Turin, L. 1996. "A spectroscopic mechanism for primary olfactory reception." Chemical Senses 21 : 773-791. Turin, L. 2002. "A method for the calculation of odor character from molecular structure." Journal of Theoretical Biology 216: 367-385. Turin, L. 2004. "Rational odorant design." In D. Rowe, ed., Chemistry and Technology of Flavours and Fragrances. Oxford, U.K.: Blackwell Publishing. ISBN 1405114509, 261-272. Turin, L. and F. Yoshii. 2003. "Structure-odor relations:a modern perspective." In R. L. Doty, ed., Handbook of Olfaction and Gustation, second edition. New York: Marcel Dekker. ISBN 0824707192. Weedman, D. 1997. Neuroscience Tutorial. Washington University School of Medicine. Retrieved March 18, 2007. ScienceDaily Article 08/03/2006, Quick—What's That Smell? Time Needed To Identify Odors Reveals Much About Olfaction. This page was last modified on 19 December 2018, at 16:31.